A few days ago I was displaying a large spread of books among a mission-minded, justice-seeking, group of energetic, evangelical folks. Per usual, I was given the chance to highlight some books in the crazy-talkin’ book blitz announcements I do. 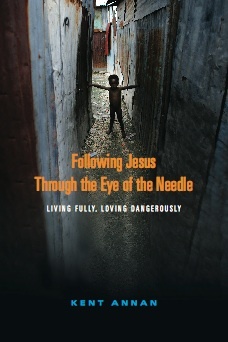 That week I had begun to read the very moving collection of stories about Haiti, Following Jesus Through the Eye of the Needle: Living Fully, Loving Dangerously by Kent Annan (IVP; $16.00.) I chose not to push this book amidst my other book plugs because I did not want to appear as if I was trying to sell books at the expense of the horrific tragedy unfolding on the news that very day. That one good friend, sitting near me, there, himself was from Haiti, and had a brother missing (pray for him, please), again, made me fall silent about this fabulous book. Well, there is plenty of stuff on line. (What did you think of the David Brooks piece in the New York Times about cultural change?) We could recommend some fascinating historical studies of the colonialism, despotism and poverty of that troubled land, and there are memoirs that capture much, such as the award winning Brother I’m Dying by Edwidge Danticat. Perhaps it is important to study a bit, even now as we pray and fret and give. Many of us know people in Haiti, and some BookNotes readers have gone there on short term mission projects. In the months and years to come, we will be called upon to think through strategies and policies for church and state. It doesn’t hurt to be thinking about that, now. And so, here it is: Kent Annon’s brand new book is incredibly powerful, including challenging Biblical reflections and tons of stories gathered as codirector of Haiti Partners. We mentioned it when it first came out last month, and we respect and trust his work. As the title suggests, it isn’t just about Haiti, though, but a reflection to all of us about Godliness and service, about love and hope. You may recall that we’ve promoted the provocative and creatively-written books about urban ministry by Greg Paul (God in the Alley and Twenty-piece Shuffle.) Of Following Jesus Through the Eye of the Needle he says, “Kent takes the reader on a ride through the hot spots of both this world and the individual’s soul. By turns wrenching and funny, and always honest, his own story puts an unerring finger on that difficult place where a questioning mind and an open heart meet.” There are no platitudes here, and he is a raw and honest writer, giving us a very good read. Mostly, though, it is about his journey to the island culture and the poverty and joys of work in Haiti. And what it all means about our own commitments to live with passion and risk and hope. Highly recommended. Haiti Partners can be found, here. I listened to two songs this morning, one which we sang in church, one which we listened to on my daughter’s ipod on the way home. The first was a brand new hymn lyric written by my friend Carolyn Winfrey Gillette, who has two songbooks (Songs of Grace and Gifts of Love) that we sell which are full of such custom-made song-writing for special occasions, often with an eye to God’s call to do justice and serve others. You can find read or listen to her song “In Haiti There is Anguish” (to be sung to the tune of “Beneath the Cross of Jesus” )here. (Others of her songs are at the Church World Service website, available for free. Interestingly, Carolyn gained a great concern for the poor and global missions while going on a short term mission trip to Haiti years ago when she was a college student.) If you are involved in helping craft litanies or liturgical experiences around disaster relief, here is a page that is jam-packed full of links, pages, and resources from across our denominational landscapes, prayers, artwork, songs and more. After worship, Marissa and I listened to the understated song Haiti, by the unusually thoughtful alt- rock group, Arcade Fire. (Their singer Regine Chassagne has a Haitian background, and sings of the atrocities others experienced under Duvalier.) Watch this nicely done colorful YouTube video of the song, with lovely footage from Haiti. It is an allusive piece, some of it sung in French. I recommend the passion of this live version, here, and the lyrics, here. Carolyn’s hymn and a rock ballad. Different musical styles and themes, both helpful to encourage us on the journey of these trying days. Listen, and pray, study and learn. “What did you think of the David Brooks piece in the New York Times about cultural change? )” Well, since you asked…. At a quick first read, I had two questions. Brooks lumps government aid and NGO work together, but is “growth” the only goal of aid? My wife worked at a Mother Theresa community in Haiti, and I’m pretty sure the aim there had more to do with compassion and survival than with future economic growth. I think she’d say that aspects of the work she did there were very successful, at least at the “what would Jesus do” level, even if it added nothing to the GDP. Second, Brooks points out that “Over the past few decades, the world has spent trillions of dollars to generate growth in the developing world. The countries that have not received much aid, like China, have seen tremendous growth and tremendous poverty reductions. The countries that have received aid, like Haiti, have not.” Is that evidence of failure or of correctly targeting humanitarian aid? Does he think it would be evidence of success if we’d given a bunch of aid to China (by his reasoning we’d be able to claim that our aid must have been effective). Truth is, China did just fine on its own. Isn’t it good that we recognized that that was going to happen? There’s a lot to what Brooks says, and Haiti is obviously nobody’s idea of aid efficiently deployed, but I thought some of Brooks’ logic was circular. It’s easy for a partisan commentator to say they needed Kemp-style economic initiative zones or whatever, but I’m pretty sure that was never an option, for presidents either Democratic or Republican. Thank you SO much for this feedback. I often like Brooks, and appreciated him a lot in this, but, as you note, there are some concerns. I’d recommend that anyone interested in discussing the Brooks piece go to Viewpoints blog, a blog by a good friend. As you can see, he commended the Brooks piece and then added some more input about liberal multi-culturalism being a major part of the problem. I wrote back saying that it is also true that the World Bank and IMF have a part of the blame to bear, and their worldview isn’t so much lefty multi-culturalism but the ideology of neo-liberal markets and economic reductionism. My friend then posted a fair response to my piece, linking to his first article and to my rebuttal. Byron! 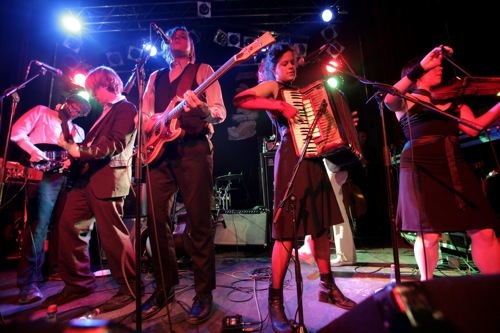 Arcade Fire is awesome. Haiti is definitely one of their best. Crystal (my wife) and I went to see them in NYC about a year and a half ago. All the proceeds of the concert went to building a hospital in Haiti.